FRANKFURT -- Robert Bosch, the world's largest car parts supplier, is confident it will grow globally in 2012 despite a worsening economic outlook, particularly in Europe. "Whether we see stagnation or even a recession depends largely on how rigorously and quickly the necessary reforms are carried out in the euro zone," Bosch Chairman Franz Fehrenbach said in a statement Tuesday. Bosch reported record sales in its automotive division of more than 30 billion euros, a rise of 8 percent from 28.1 billion euros in 2010. The company, which also has consumer goods and industrial technology division, sees overall group revenues rising in 2012. "Despite the economic uncertainties, we expect a revenue rise between 3 percent and 5 percent for Bosch Group," Fehrenbach said. Bosch Group reported that its 2011 sales rose 8.8 percent to 51.4 billion euros. But pre-tax sales results rose just 5 percent, missing the company's target of 7 percent to 8 percent after rising material and investments costs were removed. Fehrenback said he expected revenue growth for the company to be driven by China, India and the Americas this year, and forecast the global economy to rise by about 2.5 percent year-on-year after growth of about 3 percent last year. In 2009, Bosch posted its first annual loss in decades as new-car sales plummeted amid a world credit crisis. Since then, the parts supplier has enjoyed a strong comeback, driven by growth in North America and Asia. Bosch is due to release full-year earnings on April 26, when Fehrenbach has said he will try to provide a more detailed earnings outlook for 2012. On Tuesday, Bosch announced plans to buy U.S.-based SPX Corp.'s diagnostic and service tools division for 883 million euros ($1.15 billion) in a move to boost its presence in the sector, particularly in North America and Asia. 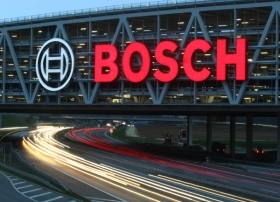 If approved, the deal would mark the largest ever for Bosch's automotive aftermarket division. Bosch's goal to keep the share of annual revenue from the group's automotive division at roughly 50 percent of the total remains unchanged, despite the SPX deal, Fehrenbach said. He added that Bosch has enough available capital to make takeovers in any segment where it finds a suitable target. Bosch ranks No.1 on the Automotive News Europe list of the top 100 global suppliers with worldwide original-equipment automotive parts sales of $34.6 billion in 2010.